I don't know about anyone else, but as someone who has actually worked at one of those jobs where you take a shower at the end of the work day and not before you go in, I'm sick to death of watching these overpaid television pundits and their counterparts in the Congress, nonchalantly discussing raising the retirement age. It may not matter much to them, but there are real economic hardships involved when you force the average wage earner out there to continue to work until they drop dead if the retirement age is raised any higher than it already is now. If our beltway Villagers and politicians really believe that it's no big deal to raise the retirement age for the rest of America, how about we ask them to walk a mile in our shoes? I wonder if any of them would decide that maybe it's not such a great idea to be doing physical labor well into your late sixties if they were the ones actually having to do those jobs? 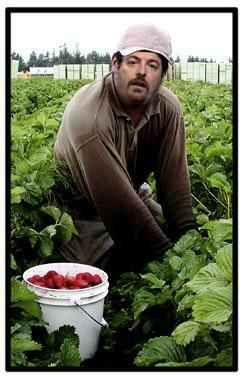 I wonder if Chuck Todd would be a little more worried about when he might be able to retire if he were say, some migrant worker picking berries and in need of daily visits to the chiropractor he can't afford because his back is screaming all day from being bent over? Or how Mrs. Greenspan would feel if she were working at Mickey-D's flipping burgers and serving fries and standing on a ceramic floor, with her varicose veins getting worse by the minute? 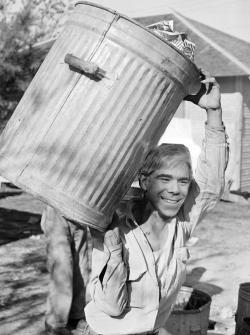 Or how David Gregory would feel if he was the one hauling out your neighbor's trash every day of the week in need of that rotator cuff surgery he can't afford after the job has taken its toll on his shoulders week after week for decades? H/t to our illustrious Photoshopper and C&L contributor Fran for the work above. If anyone has a submission of their own, please feel free to post them in the comments section and we'll use the best ones for future posts here at C&L. You can sign MoveOn and Bernie Sander's petition to leave Social Security and Medicare the hell alone here which will be delivered to the House, the Senate and President Obama -- Stop Dismantling Social Security and Medicare. The AFL-CIO has a petition up here as well -- TELL CONGRESS: PROTECT OUR FUTURE. You can read more at their blog on the matter here -- Another Poll Shows Americans Reject 'Grand Bargain' Cuts to Social Security and Medicare. And for more on what we're up against with the media fearmongering on this issue, here's a sample of what most CNN viewers are treated to, week after week, every Saturday afternoon on Your Money. Sadly this is no outlier either -- not for this show or the rest of the networks. This is the drumbeat by the corporate media whether it's Fox, or CNN, MSNBC, ABC, CBS, NBC or PBS and it's only going to get louder in the coming weeks. And here's more from Sam Seder, discussing Ezra Klein's article from this past October -- There’s nothing ‘courageous’ about raising the Social Security retirement age. Meanwhile, you could do more to erase Social Security’s shortfall by simply lifting the payroll tax cap. A lot more. According to the Congressional Budget Office, raising the federal retirement age to 70 would solve about half of Social Security funding problem, while lifting the payroll tax cap would solve all of it. As it happens, lifting the payroll tax cap would also end up costing eminent think tankers and journalists and lobbyists and politicians a whole lot of money. Perhaps consequentially, it’s a rather less popular policy idea in this town. Many consider it an easy way out, even though it would be much harder on them. Courage and sacrifice for thee, but not for me.